Home > Used Vehicles > 2018 Subaru Outback 3.6R Limited w/Eyesight,LEATHER,SUNROOF,NAVIGATION,BLUETOOTH,BACK UP CAMERA,MUCH MORE!!! 2018 Subaru Outback 3.6R Limited w/Eyesight,LEATHER,SUNROOF,NAVIGATION,BLUETOOTH,BACK UP CAMERA,MUCH MORE!!! Low Mileage, Navigation, Leather Seats, Sunroof, Blind Spot Detection, Power Liftgate! 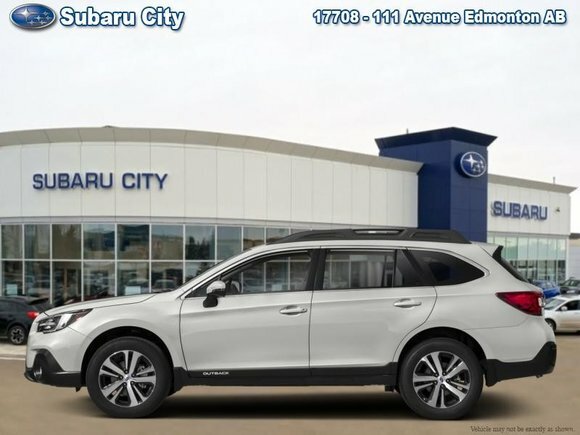 This 2018 Subaru Outback is fresh on our lot in Edmonton. More than just a wagon, the 2018 Subaru Outback is an intriguing alternative to a traditional midsized SUV. It has more cargo space than most larger competitors and less thirst for fuel. Functionally, it does everything most midsized SUVs can do and more. This low mileage wagon has just 8604 kms. It's crystal white pearl in colour and is completely accident free based on the CarProof Report. It has an automatic transmission and is powered by a 3.6L H6 24V MPFI DOHC engine. This vehicle has been upgraded with the following features: Navigation, Leather Seats, Sunroof, Blind Spot Detection, Power Liftgate, Rear View Camera, Remote Keyless Entry. It has some remaining factory warranty for added peace of mind. Want to try the 2018 Subaru Outback 3.6R Limited w/Eyesight?